 Dubbelvagn Sdggmrs25 Wascosa "Euro Leasing / Intercargo"
Dubbelvagn Sdggmrs25 Wascosa "Euro Leasing / Intercargo"
Dubbelvagn Sdggmrs25 Wascosa 'Euro Leasing / Intercargo' längd över buffertar 393 mm, epok V-VI. Articulated double pocket wagon type Sdggmrs25 - T2000 of the Wascoa. Epoch VI. 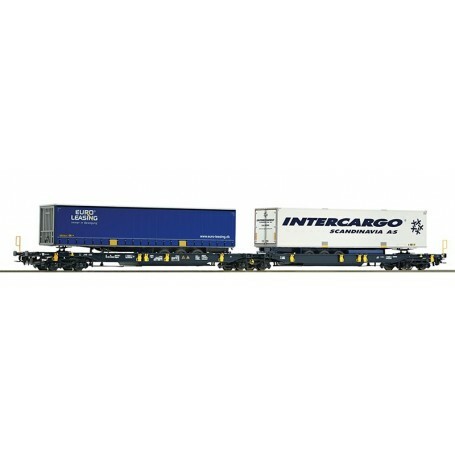 The vehicle carries a semitrailer of the company 'Euro Leasing' and one cooling trailer 'Intercargo'. Rich detailing on the model. Coupler pocket according to NEM 362 standards with close coupling mechanism.